Zut, the day is half gone, and I have not written! The reason is, I have been deep-cleaning the house. Yesterday it was the kitchen and today it is the bedroom. Just now something that made me stop and laugh. I used to get to review dumb movies for the paper and while I was cleaning up my room I found my notes to one of them. Ha, ha! The movie was not much fun but my notes were! 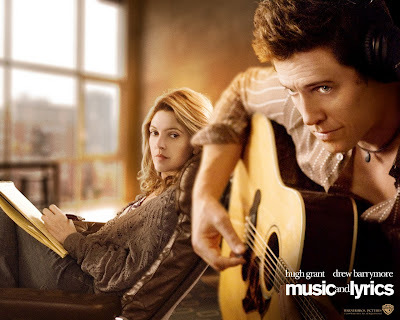 I think the movie was "Music and Lyrics," this dippy romance with Drew Barrymore who, normally I like Drew Barrymore but this movie, as I remember, embodied everything that is wrong with modern romantic comedies. Listen to me kvetching about modern romance. I am like Leonard Pennario! In the movie, as I recall, Drew Barrymore writes poetry and she hooks up with a singer-songwriter and they write songs together, something like that, who knows. It came out in 2007. I just checked. That says something about the junk hanging around my room. It is like an archaeological dig! The "action under the piano," by the way, means not the action part of the piano but that amour is taking place under the piano. I sort of remember that. People analyzing each other. "You think life is this fairy tale and when things don't turn out you can't deal with it." Easy to love someone when he is in front of an arena crowd with everyone cheering him. That is something else ridiculous, arena rock. Son of a sea cook, what a dumb movie that was! Anything is more romantic than that. If you want to see a great movie, with romance in it, we just finished watching "Mongol". Yes, I hear you, but trust me, it's not just battle scenes and yurts.